Best hikes in the Smokies? It was hard deciding. There are many wonderful hikes in the Smokies. The Great Smoky Mountains National Park has over 150 hiking trails covering over 800 miles. You'll find all kinds of hikes from short to long, easy to challenging, even waterfall, family, and river hikes. There really is something for everyone in the Smokies. Alum Cave to Mount Le Conte The #1 reason to hike this trail is the scenery. The views are just awesome. Other highlights are Le Conte Lodge, the bluffs on Alum Cave, and the llamas. Gregory Bald The views from the bald are a good enough reason to hike to Gregory Bald anytime of the year. Flame azaleas are the reason to hike it in late June. In the spring, you'll see plenty of wildflowers along Gregory Ridge on your way to the bald. Hemphill Bald/Cataloochee Divide A cool stone table, peaceful valley views, and hiking along the park's border are why you'll want to hike these trails. If you can hike them together, even better! 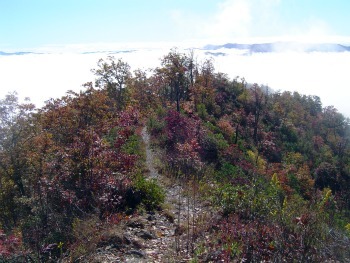 Hiking this trail will give you the thrill of seeing mountain views on each side of the trail at Lonesome Pine Overlook. There's even a nice big rock to sit on to take in the scenery.